This fall, my two children moved from a warm and caring New York City public school where a large percentage of the students live at or near the poverty level to a progressive private school comprised of many families in (or close to) that much-scrutinized 1%, to use the Occupy Wall Street parlance. What has the change meant for the kids on a day to day level? One of the most obvious things is that they have come face-to-face with the stark reality of America’s income inequality. For them, this is most apparent in the size of their friends’ homes. While many of their old playmates live in cramped apartments in government subsidized housing, a sizable number of their new friends live in cavernous lofts and single-family townhouses. As is human nature for children and adults alike, my kids are prone to comparing what our family has to what they perceive is bigger and better. I’ve been spending a lot of time lecturing them about the detriment of “keeping up with the Joneses” and the false trappings of materialism, but that tends to fall on deaf ears. I also point out endless examples of good people really struggling, including the families who experienced massive loss during our recent storms here in the Northeast. They grasp this, having seen a lot of this damage with their own eyes. They even volunteered setting up cots at a local shelter during tropical storm Irene. 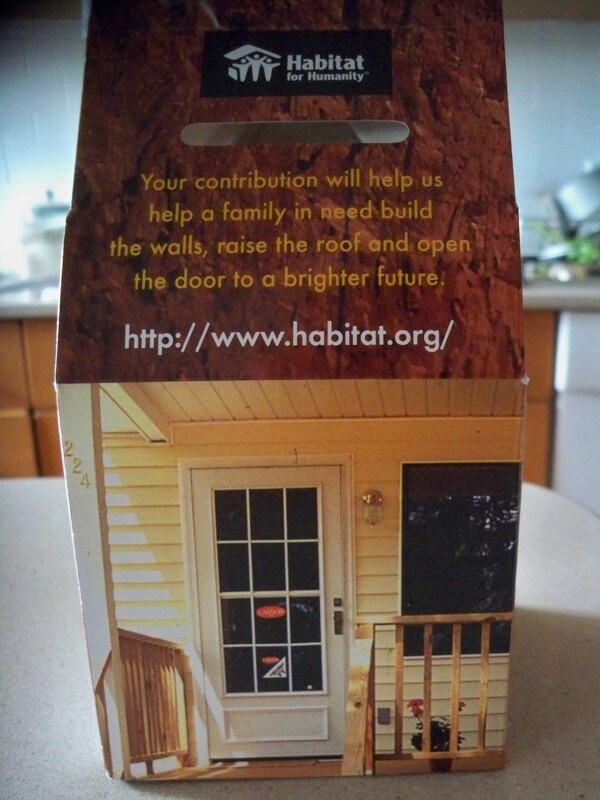 But nothing helped to cement an appreciation for what we have better than a simple holiday coin collection box from a nearby branch of Habitat for Humanity. For each room in your home, deposit 10 cents. Talk about what it would be like to live in a one room house. If you have a pantry to store extra food, be thankful and deposit 25 cents. Many families live day to day for meals. What more would you sacrifice to give others a more abundant life? The Habitat for Humanity in Paterson, NJ will use the cash collected this season for new, affordable homes. What’s more, we can feel good that the houses will be energy efficient and economical for families to maintain in the long-term. Has this project cured my children of the tendency to want more and more? No, of course not. But the act of pausing to look at the everyday conveniences we take for granted made for a unique introspective exercise in appreciation. Best of all, it linked this new understanding with actual holiday giving. And for these things, this parent is enormously grateful.